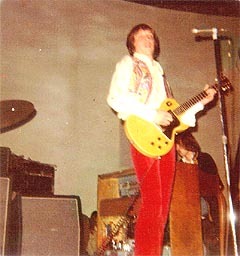 Here are some old Procol pix that a friend of mine took years ago, I believe from a gig somewhere in Florida. The pictures were taken in the late sixties (they were actually negatives which I had developed) by a Cuban fellow named Al Hernandez who I believe was living in Miami at the time. I haven't seen him in about twenty years but he was an interesting guy who loved English pop music, esp. Procol, The Hollies, Zombies, early Bee Gees, etc. 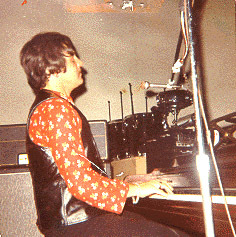 Mr Brooker at the piano in his leather weskit, microphone on a long boom Jerry Lee style. 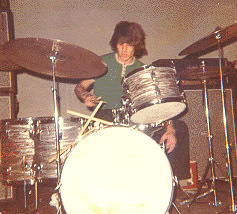 BJ Wilson at rest, with the fairly minimal kit that is familiar at that period. BtP features several photos of Barrie in that particular shirt! Randy Barnett writes, 'Trower is using a mid - late '50s Les Paul Special (Gibson would not reissue this guitar until much later). Interesting choice of weapon - most of his contemporaries would play the humbucking pickup-equipped higher end Les Paul models or Strats. 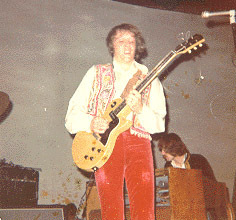 Lesley West is the only other guitarist that seemed to favor P-90 pickup guitars (I think he had a Junior - single pickup version, almost a student model). These guitars are worth a fortune now due to their unique sound and relatively low survival rate. Another glimpse of Robin and Matthew, with further lurkers by the Hammond. Note the lack of psychedelic light-show on that somewhat dreary rear wall! The predominance of Trower photographs underlines one of the band's image-problems: the vocalist is sitting at the piano and you never see him face-on. This problem was overcome on 1990s tours when the digital piano largely took over from the acoustic grand, and allowed Gary to face outwards from the middle of the band. It appears that Gary is crossing the stage while guitar and drums are still playing ... or perhaps this was taken at a soundcheck? A very rare glimpse of Dave Knights, between the Commander and our beloved Octopus. Robin seems understandably reluctant to let go of his prize guitar: not so Dave his bass. 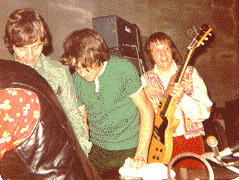 Coming offstage, BJ, Robin, Matthew in fetching jacket with gold trim. Who's that lurking in the background? Could it conceivably be Kellogs?